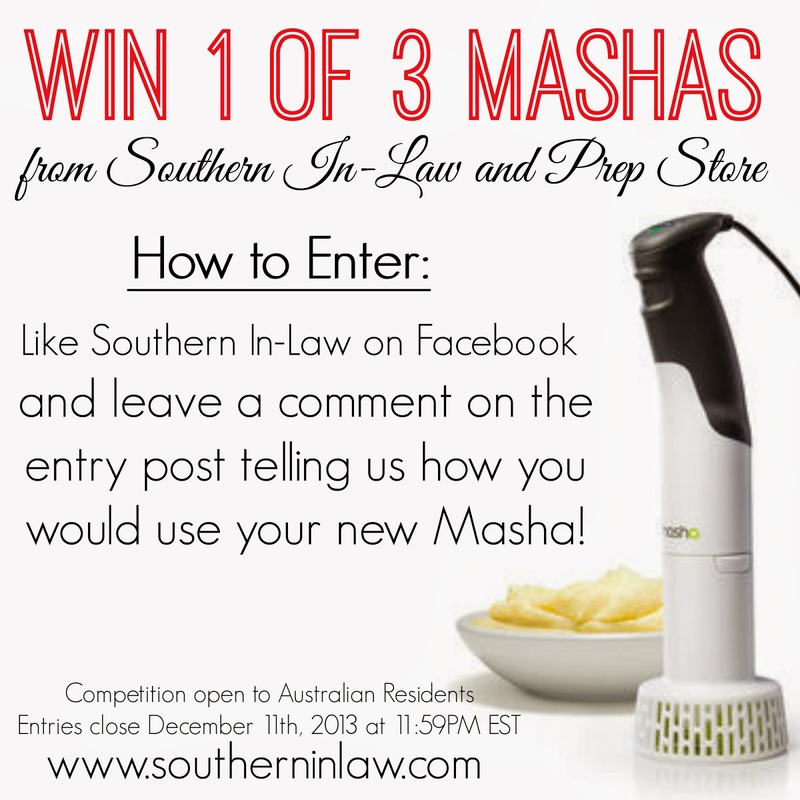 Southern In Law: Christmas Gift-Away: Win 1 of 3 Mashas! Christmas Gift-Away: Win 1 of 3 Mashas! Our annual Christmas Gift-Away is back for another year and I'm like a giddy child! I love that I get to share some of our favourite products with you to thank you for your support of Southern In-Law and the companies that are jumping on board our gift-away bandwagon are some of the best! Today I have yet another competition for you - this time, we're giving away a Masha. You may have seen my review of the Masha before - it's basically the secret weapon for anyone wanting silky smooth purees or mashed potato - it's brilliant for avocado (no more mashing avocados for guacamole for hours) and you can even use it to make scones! I showcased it in my recipe for Fruit, Flax and Veggie Muffins, however, I use it for mashing bananas for banana bread or making pumpkin or sweet potato purees and it makes mashing avocados a breeze! Step two: Leave a comment on the entry post on Facebook telling us How would you use your new Masha? Step three: The three chosen winners at the end of the competition period will be notified via Facebook - so make sure you're a valid liker of Southern In-Law at the time or we won't be able to include you! Competition is open to Australian Residents and closes on December 11th, 2013 at 11:59PM EST. The best valid entry will be selected as the winner by Kristy, Jesse and Westfield and notified via email. Should the winner not reply within 14 days of contact, an alternate winner will be selected. Please note: the winner must be a valid and current liker of the Southern In-Law Facebook or other relevant social media pages at the time of competition's close. To cook the perfect mash potato of course! My secret ingredient is Philadelphia Cream Cheese! Makes it sooo creamy!